One of the most important treatments offered by the NHS within the UK is surgery. Much of the NHS activity and front line care for patients is predominantly accounted for by surgical staff and the resources the need to practice. With continuing innovation an increasing number of medical conditions are being remedied or managed by surgery. Data from Health and Social Care Information Centre (HSCIC), Hospital Episode Statistics 2013/14. Extracted from the Health and Social Care Information Centre 2014 workforce census data. Consultants only working in the private sector are excluded from this data. 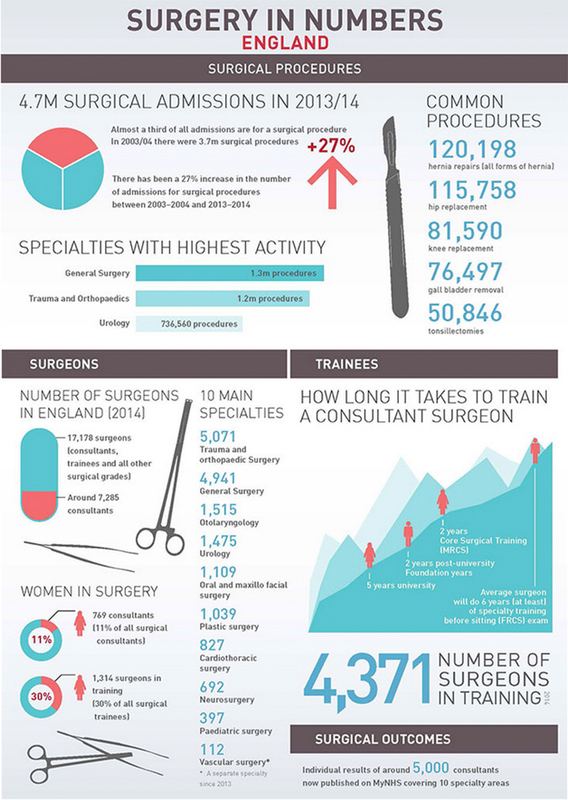 Based on figures provided by the Joint Committee on Surgical Training as at 23 July 2015. The numbers include surgeons in England on surgical specialty training, core training, locum appointments for training posts, and fixed term specialty training appointments. Calculated by extracting consultant data (HSCIC Workforce Census Data 2014) and adding data on surgeons in training from the Joint Committee on Surgical Training.